It’s always a bit ominous when you set off for an evening to see a show knowing it hasn’t been particularly well-received by the critics and the general public. I’d bought tickets for us to see Paul Merton’s new Out Of My Head Tour , for Rory’s 16th birthday: he has always loved Paul on Have I got News for You and Dougie and I have long been fans, since the days of Whose Line Is It Anyway? We’d been looking forward to the show at King’s Lynn Corn Exchange but now I was starting to doubt our decision as some people were suggesting it wasn’t really stand-up, the jokes were dated and that the show, where the audience would ‘discover the bizarre workings of Paul Merton’s brain, as he muses on the mighty behemoth that is his noggin’ was ultimately disappointing. Well, I’m happy to say that my family and I really enjoyed it. There were times when a belly laugh was appropriate, other times a good old chuckle was the order of the day and, on occasions, a wry smile was called for. It was quite old-fashioned in style, with a music hall atmosphere and content reminiscent of a university revue: Pythonesque flying bunnies, ventriloquism and some very silly sketches made for a great evening’s entertainment. Paul is joined on stage by his wife, Suki Webster and old friends Lee Simpson and Richard Vranch. Whilst Merton recounts life-changing moments at school, his first forays into television and a stay in a psychiatric hospital, his team bring the stories to life with music, magic and improvisation. Some parts work better than others but the overall content is fun, warm and engaging. As a family we’ve seen a lot of stand-up comedy over the last few years: Rhod Gilbert, Ross Noble, Russell Kane, Dave Gorman, Micky Flanagan and Milton Jones. Paul Merton’s show isn’t a typical stand-up performance. In fact, he sits down for a fair bit of the evening. But standing up, sitting down, or floating on his bed up to the moon, he proved to be a very likeable, funny man. If you want to see for yourselves, the tour continues across the UK until the end of May. Note added after publication: I did write that I felt most of the audience enjoyed it, judging by the applause, but comments below suggest this wasn’t the case, I have removed that sentence so my opinion is my opinion alone. We too went to see this show at the Corn Exchange and frankly left rather disappointed. I think if it hadn't been Paul Merton presenting this show then most people would have felt short-changed. Pauls reputation saved the show from being a disaster. If an unknown comedian had attempted what Paul produced then I think this show would probably have sunk without trace. It just isn't funny or entertaining enough to stand on its own two feet without piggy-backing on Pauls reputation as a national treasure. I so wanted to enjoy this show but for me it just was not good enough, and judging by other reviews many,indeed most critics agree. Thanks for commenting Andy. I'll probably have to add an addendum to this to say maybe I was wrong in suggesting most people enjoyed the show. It's good that you've let me know. I read a lot of the reviews before we went along, so I knew what most people had thought. I still enjoyed it. No it wasn't that well received actually. Most of the people where I was sitting barely tittered, particularly at the tedious "Steam Room" sketch. Several people did not return after the interval. We saw Boothby Graffoe a few weeks back and his show knocked enormous ironic spots off this. I love Paul but I think that his humour is more effective bouncing off others (ie Ian Hislop) rather than trying to carry a whole show by himself. Thanks, Anon, for commenting too. Looks like you and Andy felt the same. I think I had the theatre's 'big laugher' behind me so got the feeling that there was more enjoyment in the audience than maybe there was! I think Paul has always been a peculiarly acquired taste. On the whole I like him but I do find he misses as much as he scores a hit sometimes. Rhod Gilbert, however, gets me every time. You're right. I have some friends who aren't keen on him at all. And yes, some bits worked for me and a few made me cringe, but overall it was a hit with me. I'd love to see Rhod Gilbert again: he's got a new tour at the moment so may try and get tickets. We saw him in Peterborough and he was excellent- very sharp. Although I love most strands of comedy I rarely go to see individual performances such as this. I may be wrong but I know I would enjoy a stand-up routine of say 15-30 minutes but I struggle to envisage how any single comedian could keep me entertained for an evening. And if they could then laughing heartily for that duration is quite a tiring process. Having said that, we did go to see Armstrong & Miller and thoroughly enjoyed it albeit with the occasional weak spot. But then Armstrong & Miller isn't an individual performance (I got a clue for that from the title). We've been going to stand-up comedy for a while and it isn't as tiring as you might think. Usually they have a warm up act who performs for 20 to 30 mins and then the main act does his or her act after the interval. People like Rhod Gilbert and Micky Flanagan are good story tellers and there is a thread to the routine which moves it along well. Dave Gorman does a PowerPoint presentation in his to keep it lively. Ross Noble is completely off the wall. Paul Merton's show was more of a sketch show, with bits of solo stand up in between. Maybe it's just our thing as a family! Most touring comedians produce generic stand-up shows, featuring observation humour or beautifully honed themed shows where every word has been carefully crafted. And then there is Paul Merton. He first came to prominence in the 1980's doing improvisation on Channel 4 before cementing his reputation as one of the fastest wits on television in the everlasting " Have I Got News For You?" The long-running Radio 4 show " Just A Minute" has also allowed him to show a competitive streak as well as giving him the opportunity to disappear into his individual flights of fancy (for no more than 60 seconds). So,for his first stand-up tour he decided to avoid the loneliness of a solo outing and invited some friends along for company (including Richard Vranch who I have seen before, providing musical accompaniment on an Improvised tour) Basically, the show revolves round Paul Merton's life, mainly concerning the period he spent in a mental institution whilst appearing on " Whose Line Is It, Anyway?". This is obviously an extraordinary story and gives him the chance to reveal the surreal nature of what is inside his head. He is well known as a fan of silent movies and music hall and this evening is a throw back to the old-fashioned days of variety, general silliness and occasionally, really bad jokes. Any youngsters there to see that funny guy off the television may have wondered what they had wandered into, but anyone of the comedian's age would have enjoyed the nostalgic value of what they were seeing. This was not a slick performance. His delivery was nervous, often tripping over his words and repeating himself but that, somehow, only seemded to add to the chaerm of the evening. His companions (including the funny and versatile Suki Webster and Lee Simpson) re-created moments from his life and provided some impressively visual images, including gloriously, his bed flying to the moon. The greatest compliment I can make is that I hadn't been well all day and only willpower got me to the Millenium Centre. I may have only just been able to walk to my seat but the power of good comedy re-vitalised me, as I left in a much better state than I arrived. 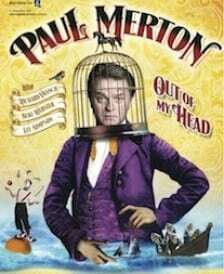 I won't claim Paul Merton has magic powers but if you want to see a fun and unusual show go and see this master craftsman at work. Looks like we agree then. Saw Paul Merton, doing a one man show, at Epsom playhouse probably over 10 years ago. Very, very funny. At Wimbledon Theatre last night was, by contrast, a massive disappointment. Virtually the entire act was a cut and paste from the show 10 years back. You got the impression he has run out of ideas, his companions on set a crutch to lean on. On HIGNFY he often appears to be going through the motions and his inability to come up with so little new material on his 2012 tour kind of confirms this. Would love to see him get his act together, but fear we may be witnessing a Premier League performer past his best and kicking around in the Conference. Thanks for adding your thoughts. Really appreciate it. I haven't seen Paul live before so that probably goes some way to explain why I enjoyed the show. Interesting to hear you felt it was a cut and paste performance as I've read that elsewhere in reviews. I do agree he sometimes appears to be on autopilot when on HIGNFY. We went to Paul's show at Woking on 29th April. I've been a fan for many years but we all felt the show was a great disappointment. We were not alone. About 10% of the audience left at the interval and the buzz in the bar was not a positive o e. The ideas were not very creative and the presentation and delivery was akin to a school play. I enjoyed the ventriloquist act but was unimpressed with the rather boring jokes and tedious droning that dominated Paul's dialogue.. The delivery appeared nervous and "in the style of Just a minute" He talked at us rather than engaging "with" us. I agree with an earlier review – he needs to get his act together and reflect on his material. Thanks for adding your comments, Brian. Good to have opinions on this. Seems like a bit of a marmite show, this one. Have searched comments on Twitter and it's quite mixed. My wife and I went to see Paul's show in York last Friday and I can honestly say it was one of tne worst performances I have ever seen. We loved his improv tour last year but this was in complete contrast, rambling stories with no ending or punchline and the language was immature at best. I wanted to leave at the interval, my wife hoped it would improve in the second half, judging by the people around us, we were not the only ones to feel short changed on the £24 tickets. One to miss. I saw this show last week at the Vaudeville Theatre in London, and I enjoyed it! I thought it was silly and had a certain charm – maybe the people who complained just don't like this kind of humour, or maybe it has improved in the last few months? Thanks for adding this, Hel. I wonder if the show has changed at all, following the mixed reviews? Interesting, reading Dan's comment above (which I forgot to reply to) that even if people are fans of Paul and his previous performances, that this particular tour has been rather hit and miss. Reassuring for me to know I wasn't alone in finding it entertaining!